Whenever you're working on a Spring MVC project, you might want to unit tests each single layer of your application. In this post, we'll see how we can perform unit testing on the persistence layer, using TestNg. More specifically, we'll go through unit testing a persistence layer that is built upon a DAO pattern, implemented using Hibernate. As you can see, this class is annotated with @Repository, which registers it as a "Repository" type Spring bean. An important thing here: make sure you specify a "dataSource" bean. Although we would usually declare a bean with the ID "dataSource", when working with Spring, just know that it is also possible to have Spring properly configured without this kind of bean. Nevertheless, configuring unit testing with TestNg simply requires us to declare this bean. More (we'll see why, later). The AbstractTransactionalTestNGSpringContextTests class helps you manage the transactional aspects when testing the methods from the DAO class (as a matter of fact, it sets the @Transactional annotation at class level, so that you don't need to worry about transactions when writing your test methods). 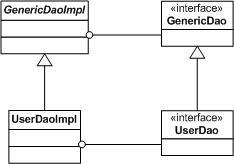 It also provide convenience methods (based upon the underlying SimpleJdbcTemplate instance...) to query the DB, such as executeSqlScript(...) and countRowsInTable(...). This class expects a bean with the ID "dataSource". That's the reason why I said on the previous section that our Spring configuration has to specify such a bean. This annotation is provided by Spring for test purposes and allows you to load Spring configuration file. This annotation supports several ways to specify which configuration to load but its "locations" attribute is likely the easiest and most used one: we just have to provide a comma separated list of String values. Each of them , referring to a Spring XML configuration file that needs to be loaded in order to initialize the Spring application context. In the example, I prefixed each reference with "classpath:" meaning that the configuration files will be retrieved from the classpath of my project (since I'm working on a Maven based project, I simply put them in the src/test/resources directory). Now, you're able to wire the DAO classes (as long as they're registered as Spring beans) into you test class, and test every single of their methods. Voilà!